Biltmore Lake residents enjoy unique lakefront living in a beautiful location amongst the Blue Ridge Mountains. 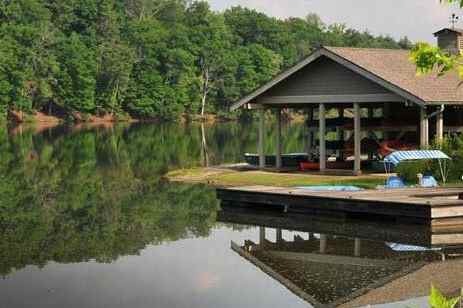 Open to all ages, Biltmore Lake is a fabulous community for active adults in Asheville, North Carolina. This beautiful development is nestled at the foot of the Blue Ridge Mountains and set beside a natural 62-acre lake of the same name. The community features an exciting line-up of amenities, as well as homes available on either a new construction or resale basis. Biltmore Lake opened in 1995 and is still in development today. Upon completion, the community is expected to include about 1,059 homes including both attached homes and single-family designs. A variety of neighborhoods within the community create a diverse setting which appeals to homebuyers of all ages. Active adult retirees particularly enjoy Biltmore's tranquil, natural environment and wide range of homes. Community recreations are largely centered around the 62-acre Biltmore Lake. Residents enjoy swimming in its calm waters, relaxing on its sandy beach or hiking the miles of trails which wind along its shores. Residents can turn to the lake for catch-and-release fishing, as well, or visit the boat house to make use of a canoe, kayak or paddleboat. The gentle waters of Biltmore Lake also provide tranquil scenery for those visiting the Biltmore Lake Clubhouse. This inviting facility has the feel of a rustic, yet casually elegant, lodge as well as modern conveniences like free wireless service. The fireside lounge offers a cozy spot to gather with friends or read a book borrowed from the clubhouse library. The community grounds also feature two tennis courts, two basketball courts and a softball field. Homes in the Biltmore Lake community are constructed by multiple builders, including Biltmore Farms, Bass & Royster Builders Inc., Pebbledash Builders, Preish Construction Inc., and Wright Family Custom Homes LLC. Homesites feature scenic settings and four neighborhoods-Scotch Ridge, Cedar Rock, Rockfish Cove and Whistler's Ridge-offer homes located at the edge of the lake. With multiple builders and the option of purchasing a custom home, Biltmore Lake offers resale and new construction homes in a wide range of styles, sizes and prices. Homes typically range from 1,300 to 3,600 square feet, while styles include cottages, townhomes, lodges and single-family homes. Although Biltmore Lake provides a quiet, rural setting, the community is also set just 15 minutes from downtown Asheville. Residents can enjoy many nearby attractions, including restaurants, shopping districts, art galleries and live music venues. For those who dream of a quiet mountain retirement, Biltmore Lake offers a charming retreat just minutes from the exciting attractions in Asheville, North Carolina.